Posted on November 16, 2011	by Derek "Gamer Crash"
From the first moment you step into the world Rage, you’re in awe of the technology running the game. id Software managed to create the very impressive idTech 5 engine to power this bad boy and visually, its extremely impressive. From a gameplay perspective, it feels like there’s something missing. There’s certainly plenty of things to do in the game with side missions, minigames, and a surprisingly fun racing component to keep you occupied outside of the main quest line. 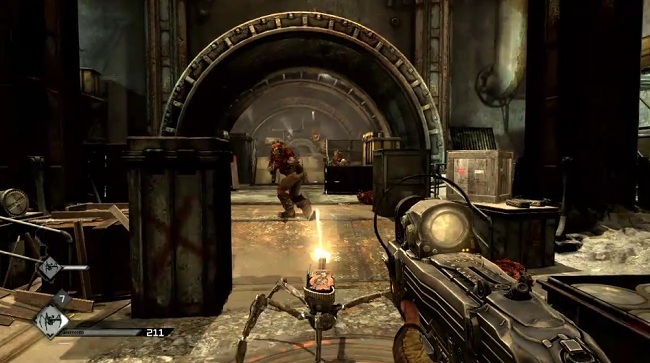 At it’s core though, Rage is a pure shooter. You play a survivor trying to make it in a post-apocalyptic Earth. So is Rage all style or does it feature some substance as well? Full review located after the break. I was generally surprised by the lack of a strong narrative in Rage. Everything leading up to the release had convinced me that in addition to the beautiful visuals, the game would offer up a compelling narrative to drive the gameplay along. Essentially, you play a nameless and voiceless Ark survivor, a person hand-picked to be cryogenically frozen under the ground to protect and eventually rebuild humanity after the comet Apophis strikes the Earth causing an apocalyptic event. At a specified time, your Ark was programmed to rise again to reestablish the human race. Things don’t go according to plan as you’re awoken early to find that the rest of the people in your Ark have perished. You set out to figure out what happened but before you make it far, you’re attacked by one of the new world bandit factions. Seems this new post-apocalyptic Earth has taken a turn for the worse. Quite simply, you’re a glorified messenger or used as a one man army for the various people you come across in the wasteland. No more, no less. Eventually, you join sides with a group called “The Resistance” who oppose a group known as “The Authority”. I mean, talk about generic, they couldn’t come up with a better name for either group? There’s a little substance on why they’re at odds with one another (which I won’t spoil here) but ultimately, it’s not nearly as fleshed out as it could have been. That’s basically the gist of the story. It’s almost like id spent the majority of their time perfecting the tech side of the game and ultimately lost the focus of the narrative. There’s plenty to do in both major cities of Wellspring and Subway Town. At first, you’re not trusted, but by doing quests or winning races, the people start to view you in a more favorable light. Quests can be found all over the place and there’s a decent number of side missions to undertake if you want. They often send you back to areas where you’ve been previously and generally you’ll get an item of value and cash for your efforts. Besides the various minigames you can partake in and a “Job board” to acquire new side missions from each town has a racing league you can join and win upgrades for the various cars you own. I was pleasantly surprised by these racing missions as they’re fun, varied, and provide a good distraction when you grow tired of shooting mutants. 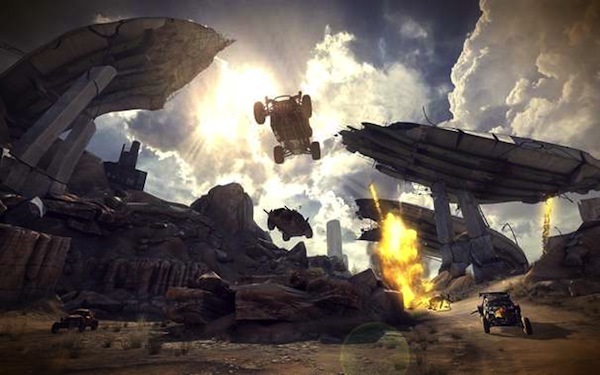 The races vary from time trials, to straight up races, and to deathmatch races which involve weapons. It’s fleshed out enough to be something you’ll find yourself going back to time and time again. You’ll spend the good majority of the game in the town of Wellspring and that’s unfortunate because I found “Subway Town” to be vastly more interesting in terms of design and the people who populate it. By the time you make it to Subway Town, you feel very rushed as the game decides that it’s time to wrap things up by that point. The mayor alone is an interesting character, but it seems just as you meet him, he gets “removed” from the game and you’re no longer able to speak with him. If you’re expecting a Wasteland that’ll rival the one in Fallout, you’re going to be disappointed. 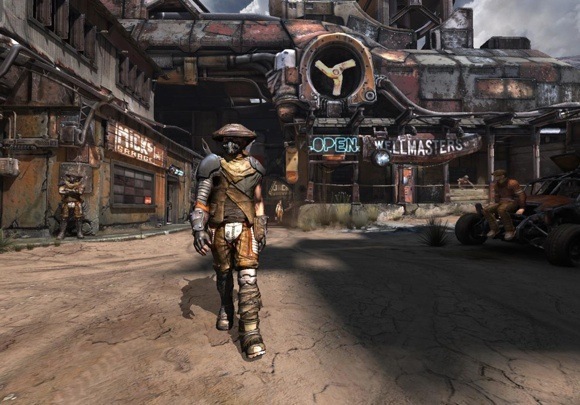 Rage’s wasteland is essentially an overworld that serves as a way from the next level to the next town. It’s not super huge and open either. There aren’t a ton of things to do in the wasteland besides driving from one point to the other. You do have a few things to do like fighting other bandits in entertaining vehicle combat and there are also Authority Drones floating around that you can try to destroy by jumping your car into them. Other than that and the very rare Feltrite Collection events, there’s not too much else to accomplish while wandering around the Wasteland. The various locations that you’ll be stomping through are each inhabited by the various (and crazy) inhabitants of the Wasteland. You’ll be going up against the Russian-like Gearheads, the tribal looking Ghost Clan, and the British sounding Wasted clan to name a few. The levels can be interesting but for the most part, they’re narrow corridors with really only one path through. Again, very much in the old school style of id Software, whether that’s for better or worse. Sadly, you’re not even given a minimap of the level either and there will be times where you’re not sure how to proceed as it’s just not clear. There are also random items scattered around each level you can pick up to either sell or use in some capacity. Once you get through the level, you’re dumped back out at the beginning to head back out into the Wasteland to return the quest. I’m sorry but I have to mention that the ending to the game is just terrible. The final mission is such a throwaway, that you never get the sense of resolution after playing through it. You fight enemies in similar looking tight corridors, pressing buttons and waiting for the system to finish doing what it’s doing while defending yourself from waves of enemies. After putting 10+ hours into the story mode, you’re rewarded with about a minute long cut scene that doesn’t explain much of anything or offer a hook that’ll make you pine for the next installment. After the credits roll, you’re dumped back to the start screen. It’s just…completely underwhelming. I get the impression that the ending had to be rushed for time’s sake. If that’s true, it’s disappointing. It’s also worth mentioning that the checkpoint/auto-save system is so archaic that it borders on criminal this day and age. The game only auto-saves at the very start of a level or when you enter the wasteland. If you die near the end of a stage, you’re rewarded to the last save point load, which in this case is probably the start of the level if you forgot to manually save. It’s a harsh reality in this day and age. You do have a built-in defibrillator that’ll basically let you come back to life, but it does need to be recharged and if you go down again, it’s game over. Biggest tip I can offer is to save often, otherwise you’ll be replaying sections over if you die. Believe me, I would know as it happened to me a few times. The biggest bright spot for me with this game is in its gunplay. The weapons feel great and give you a solid feeling when firing them. Thankfully, the game is a shooter so the fact that the guns were made well and feel well went a long way into my overall enjoyment. I will say, there’s nothing quite like blasting someone close range with the shotgun or gunning down a mutant with the assault rifle. You’ll also get your hands on weapons like Wingsticks, RC Bomb Cars and a crossbow that comes with Mind Control Darts among other types of ammo. It’s always great to use one on an enemy in a group and watch the fireworks commence. My favorite weapon though are the Wingsticks. Basically a boomerang type projectile outfitted with blades, these make quick killing a very easy thing. In fact, you’re given schematics throughout the game that lets you create different items provided you’ve found the various ingredients. You’ll be creating health items like bandages, turrets, sentry bots, different types of ammo for your guns, and even wingsticks. Ingredients can be found randomly all over the place or can be bought at shops and I never got tired of making new items to use. I know I said the game was beautiful, and it is, it’s just that it has major texture issues if you decide not to install it on your system. The engine streams the textures on the fly as you’re playing so you’ll notice them loading in as you run around. Even still, the console version (which is what I played) doesn’t have the greatest looking textures anyway. Many things appear blurry and just unimpressive. That being said, the animations are just freaking fantastic. Each person you come across moves and reacts realistically. It’s always a joy finally seeing video game characters being able to animate and express themselves in a realistic way. Also a high note lies with the enemy AI. Instead of running straight at you or stop and popping, you’ll find that they try to mix things up. Mutants tend to jump around, flipping off walls to try to throw your aim off and I’ve seen Authority soldiers get behind a soldier holding a shield. It’s really impressive to see AI reacting intelligently. In a surprise twist, the fathers of first person shooters decided to scrap the traditional multiplayer modes you’d come to expect in a FPS game. They decided to ditch the deathmatch in favor of straight up racing and destruction. After initially writing off this mode, I gave it a shot to see what it was like. Needless to say, I was presently surprised by how well it played. Think of it as something of a cross between Mad Max and Mario Kart. Many of the racing modes from the single player side appear here including classic racing, While it’s fun to play, ultimately I can’t see how much staying power it really has, especially when you put it up against the other heavy hitters this holiday season. 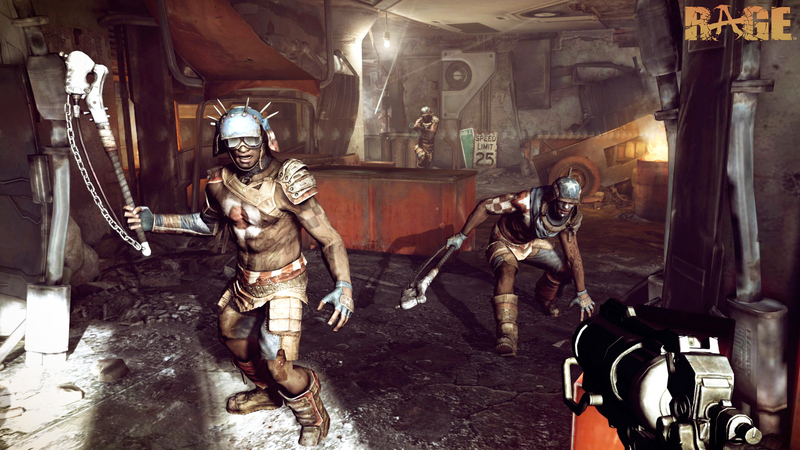 In addition to the competitive multiplayer, id has included a co-op mode known as Legends of the Wasteland. Rage feels like a game that kind of missed the mark. While it offers fun gunplay and an interesting world it also features many gameplay elements that feel very dated or underdeveloped. If you’re looking for a cross between Borderlands and Fallout, Rage will ultimately disappoint you. It features no RPG elements like progression, stat tweaking, meaningful loot, or customization of any kind. If you’re in the market for a solid shooter with a great atmosphere, then Rage may be the game for you. While the graphics and animations can be quite impressive, unfortunately, it lacks in other areas such as a compelling story. Multiplayer is also fun, but for me anyway, won’t hold my attention for long, especially with these other high-profile games currently releasing for the holiday season. I will say, I can’t wait to see id Tech 5 in other games as it can pull off some pretty amazing stuff. This entry was posted in Review and tagged PC, PS3, review, Xbox. Bookmark the permalink. Nice. Sounds like a giant tech demo. Also did you like the pistol at all. It was the most boring weapon in the game in my humble opinion.